Author: Ian Smiley; Buy New: $16.50 All the procedures needed to make a wide variety of whiskeys are described in full, concise detail, using modern and scientific methods – from Pure Corn Whiskeys to Bourbon, Peat-Smoked to Corn Squeezins', Thin-Mash, Sour-Mash, All-Grain, Rye-Mash etc etc. Moreover, the same principles can be applied to any other flavored spirit – Grappa, Rum, etc. > see also our two dollars crockpot receipes to make whiskey stills below this page. I've got all sorts of distillation equipment, but HOW do you go about making a good bourbon or moonshine without making wood alcohol and going blind? PLEASE HELP! Well here in Norway home distilling is very popular (and illegal! ), so I have some idea of how it is done. I should point out that I have not done it, or seen it done, so this information is based on hearsay, books, and what I can remember from chemistry classes. Basically there are two types of distilling; fractional and crude. Fractional distillation gives you pure 96% abv. 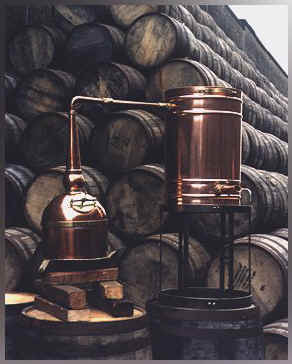 Crude distillation gives you roughly 80% abv and is used for flavored spirits, i.e. whisky, gin etc. For fractional distillation you need a fractional distillation column. This is basically a long glass column filled with glass beads. It is placed vertically above the heating container so the alcohol vapor passes through it on it's way to the condenser. To make pure alcohol you need to start with something my friends have affectionately chosen to call DYS (Dodgy Yellow Stuff). Side note: This was actually my first intro to the world of homebrewing. Me and a friend bough 10 l. off someone we knew. We had no idea what it really was, and it was really sweet. So three of us got together and in an evening polished of most of it. The down side was that it was 15-20% abv, and we were downing the stuff, straight and mixed. next morning I was this close to giving up on alcohol forever. Now even the smell of DYS makes me nauseous. Anyway DYS is simply 10kg of sugar dissolved and topped with water to 30l. still above except the fractional distillation column is removed. This means the distillation process is not as fine and some of the flavoring elements come through. You need to make a base first. This is pretty much the stuff which you want to make stronger. So for whisky you would make a very malty beer, and is alcoholic as you could possibly brew it. Then just distill this in a crude still. The stuff that comes out is roughly 80% abv. so you may want to water it down. No matter what you are distilling make sure you chuck the first 1-2 dl that come through the still as this is almost pure fusel (sp.) oil and other crap. Also be careful with the temperature when distilling, use the lowest temp possible. Some guy not to far away from where I live had a still in the basement. I don't know how big it was or what went wrong, but one day when he was out the alcohol fumes got to hot and escaped in to the room. Some how they got sparked and the foundation of his house moved about a foot out. Needless to say the ground floor was also missing. The amusing thing was that this was how his wife first found out that he was distilling. Although the alcohol you produce is pure, I'd imagine that drinking pure whiskey 96% is not very good for you. You have no idea how much government propaganda there is about the dangers of drinking '96' as its called here in Norway. As I said I haven't tried this and I probably won't, but I'd like to hear from you if you try it. One ingenious type of stills included in this book, along with seven others is the Two-Dollar "Crock Pot" still. This still consists of parts readily available from your local stores and some that are probably in your kitchen. While this moonshine still won't put you in competition with commercial whiskey producer, you could reasonably expect to run off about a quart a session. Those with an inclination toward distilling will readily see how this one works. If you aren't sure, my book The Alaskan Bootlegger's Bible explains it all in plain English. It is illegal to make your own whiskey in the US, or to possess a still without a permit. This is because Uncle Sam derives much money from taxing whiskey producers. It is not illegal to know how to make whiskey and some countries do allow their citizens to make their own. A lot of Americans have made their own however, not only old time moonshiners and bootleggers, but their modern day counterparts who worked in Mid Eastern oil fields and actually printed underground manuals on how to do it. In a meld of old and new, you'll learn how a variety of ingenious stills were built, operated and recipes for everything for traditional corn "likker," to bathtub gin. (2 lbs. sugar per gallon of water, bakers yeast and a couple of juniper berries.) You'll also learn the hazards of distilling, to include poisoning, fires, scalding, explosions and jail. For the last news about recipes for whiskey stills you should join our African Art Club and become an insider of the African art market.